The team captain of Spain’s storied football club Barcelona, which has become a focal point of secessionist Catalan sentiment, is urging politicians in Madrid and the Catalan capital to start negotiating about the future of Spain’s restive northeast province. "Before we do ourselves more damage, those in charge must open dialogue with each other. Do it for all of us. We deserve to live in peace," Andres Iniesta wrote on his Facebook page, apologizing at the same time for weighing in on "situations that are complex." His appeal came as a top EU official Thursday warned that the separatist dispute, exacerbated by Catalan secessionists holding an illegal independence referendum Sunday, risks escalating into armed conflict. "The position is very, very alarming. Civil war is conceivable there, in the middle of Europe," Gunther Oettinger, the Germany EU commissioner said at an event in Munich. The German commissioner’s startling remarks prompted disquiet among EU diplomats. One told VOA he thought the comments "nonesense." Oettinger and the EU Commission, the European bloc’s governing body, which fears Catalan independence might stir up separatism elsewhere in Europe, have also urged the authorities in Madrid and Barcelona to start negotiations and to avoid further provocations. But there are little signs of that happening. Both sides appear to be standing firm in Spain’s worst constitutional crisis since an attempted coup in 1981. Spain’s prime minister, Mariano Rajoy, has threatened to suspend Catalonia’s semi-autonomy and to introduce direct rule from Madrid. He has said there can be no talks while Catalonia’s separatist leaders are threatening to issue a declaration of independence on the back of last Sunday’s unauthorized plebiscite. In that poll, deemed illegal by Madrid, 90 percent voted to break with Spain but the turnout was well under half of the electorate. Opinion polls have consistently suggested that more Catalans favor remaining in Spain. Spain's Prime Minister Mariano Rajoy listens to a question during a news conference at the Moncloa Palace, the premier's official resident, in Madrid, Nov. 11, 2015. Overnight Friday, Catalan activists posted online video of more Spanish military trucks moving into the northeast region — some of the trucks appeared to be tank transporters but with no tanks loaded on them. Nationalist sentiment is deepening fast: in Madrid observers have noted more buildings are sporting the Spanish national flag. Spaniards have long harbored an historical fear of dismemberment — Catalan nationalist sentiment was a key factor behind the Spanish civil war of the 1930s. In Catalonia secessionist anger has only intensified over the cracking of heads last Sunday when Spain’s national police and Civil Guard fired rubber bullets, roughed up Catalans and raided polling stations as part of an effort to disrupt the plebiscite. Catalan authorities say almost 900 people were hurt in the crackdown. Spanish Interior Minister Juan Ignacio Zoido has ordered the national police and Civil Guard involved in clashes with pro-independence protesters in Catalonia during the referendum to remain in the semi-autonomous region to ensure Spanish law is observed. 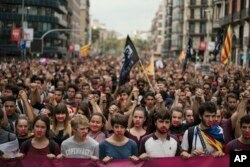 Independence supporters march during a demonstration downtown Barcelona, Spain, Oct. 2, 2017. Catalan anger has been further provoked by Spain’s constitutional court barring Catalonia’s regional parliament from sitting on Monday in a session scheduled to discuss the results of last Sunday’s referendum, and possibly to declare independence. A move to suspend the Catalan government and the region’s semi-autonomy, which is permitted under Spain’s constitution in extraordinary circumstances, or to enforce the court’s order, would likely be used by ultra-secessionists as grounds for more civil disobedience, say analysts. 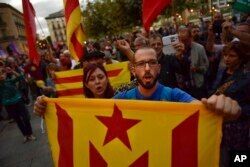 Another flashpoint could come Saturday with a rally in Barcelona arranged for Catalans opposed to independence to express their loyalty to Madrid and their opposition to breaking with Spain. Catalans opposed to secession — and Madrid — accuse separatists led by former journalist Carles Puigdemont of trying to force independence, arguing that the local law authorizing last Sunday’s plebiscite was passed on narrow majority in the regional parliament and without any proper debate. Pro-independence supporters hold up "esteleda" or pro-independence flags and shout slogans as they walk along the street during a demonstration in Pamplona, Spain, Oct. 3, 2017, protesting against the use of force by police. As both sides continued to double down, Spain’s former prime minister, José María Aznar, who served between 1996 and 2003, criticized Rajoy’s handling of the crisis, which he said was ill-judged. "In Catalonia, it is not possible to keep making mistakes for a moment longer," he said. 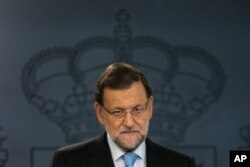 He called on Rajoy, who is under pressure from his own party not to give an inch, to search for a peaceful resolution to the confrontation or to step down and call a general election. Aznar is critical also of Catalan separatists, saying they were destroying the 40 years of democracy that had followed the death of Gen. Francisco Franco, but he added that Rajoy’s center-right government failed to understand the "nationalist dynamics" the secessionists are using to whip up anger. With the crisis deepening and no sign of an end to political instability, some Catalan businesses are considering relocating. On Thursday, Barcelona-based Sabadell bank announced it is planning to move its head office to the city of Alicante. Spain’s third largest lender, Caixabank says its board will meet Friday to discuss moving its head office to the Balearic Islands.